What exactly is a sound engineer? For starters, they play a vitally important role in the music industry. If you have ever been at a concert where you were blown away by the clarity and overall quality of the music you heard, chances are that there was a very talented engineer controlling the sound you heard. Sound engineers or audio engineers work on the technical aspects of sound and music production by mixing, reproducing and manipulating the equalization and electronic effects of sound. Sound engineers don't have to work strictly in music. Some engineers end up designing and controlling the sound at conferences, in theaters, and in any other venue that requires sound projection for an audience. 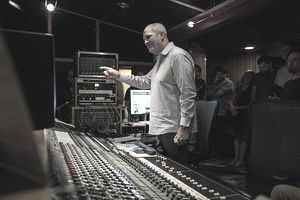 Many people think of the sound engineer as the person who stands behind the big mixing desk at a show and mixes the sound the audience hears. This is also known as mixing the "front of house" sound. But this is only one aspect of sound engineering. In fact, though, there are 4 distinct steps to commercial production of a recording including recording, editing, mixing, and mastering. As a result, there are other types of sound engineers with particular roles and specializations. Monitor sound engineers. This type of engineer takes care of the sound the band hears on their monitors on stage. If you've ever heard a band say, "can you turn down my guitar a little bit" or something similar, they are talking to the monitor sound engineer. Systems engineers. They take care of setting up amps, complex PA systems, speakers and such for the band and the other sound engineers. Studio sound engineers. They work in a recording studio to make high-quality recordings of music, speech and sound effects. Research and development audio engineers. They work to invent new technologies, equipment, and techniques, in order to enhance the process and art of audio engineering. Wireless microphone engineers. They are responsible for wireless microphones during a theatre production, a sports event or a corporate event. Game audio designer engineers. They deal with sound for video and computer game development. Sound engineers can come from a wide array of backgrounds and educational experiences. Postsecondary training in the fields of radio & television, music, audio, performing arts, broadcasting, or electrical engineering can all be lead-ins to a career in sound engineering. Many colleges and universities offer specific training in audio engineering and sound recording. Often, though, audio engineers may have no formal training, but instead, attain professional experience and skills in audio through extensive on-the-job experience.